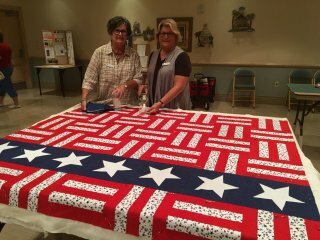 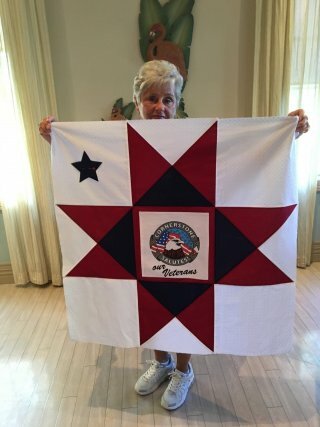 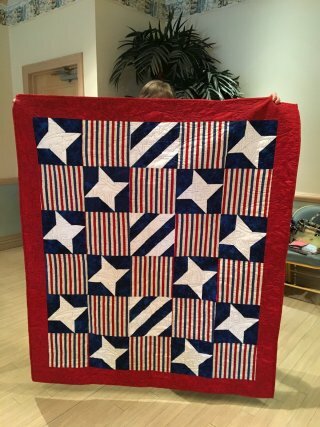 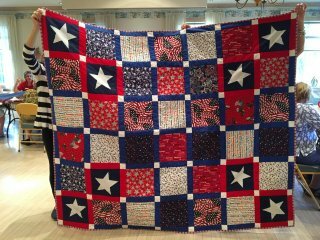 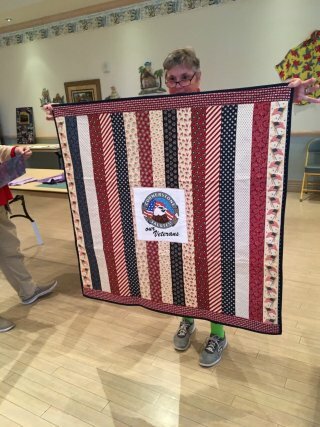 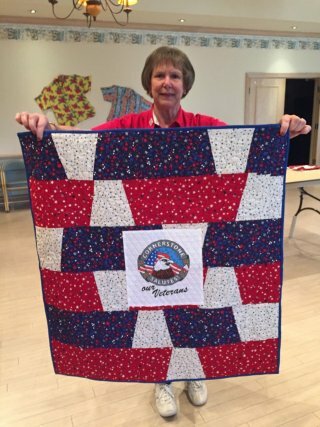 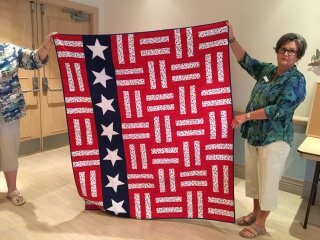 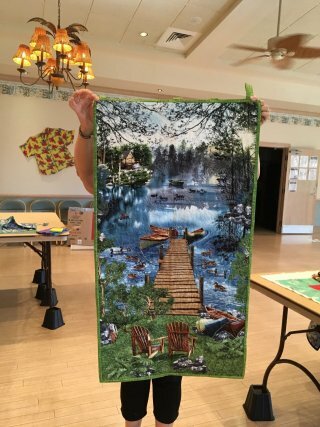 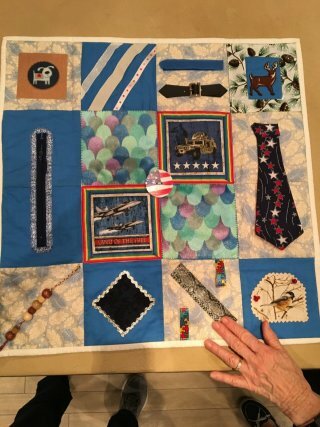 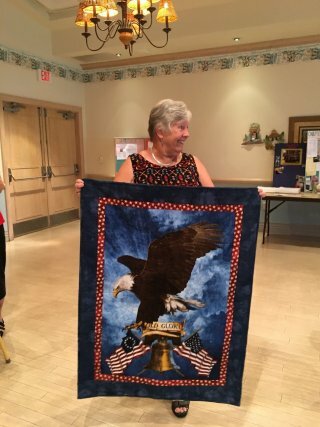 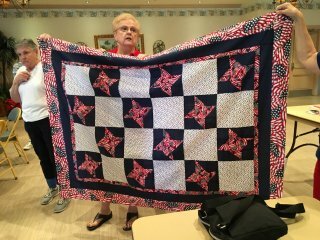 *Honor Flight Quilts - NEW SIZE! 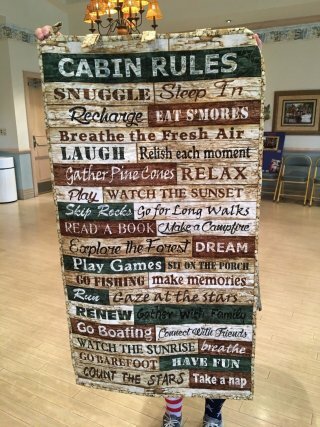 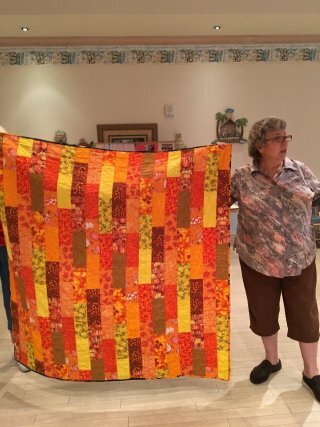 - as of 7/24/18 - 40"x 60"
*See Linda Konstanty for more info. 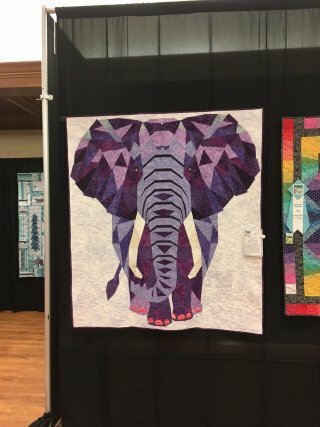 Looking for advice, how do I make this bigger??? 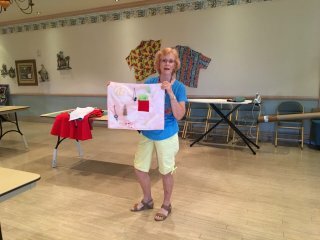 Carolyn received LOTS of great ideas! 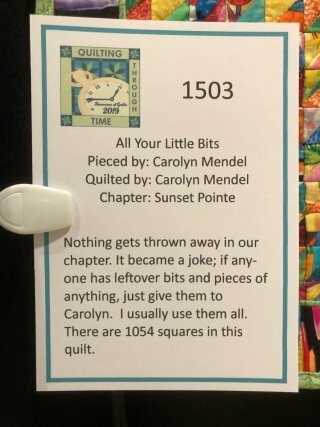 Sorry to make you tipsy, Carolyn! 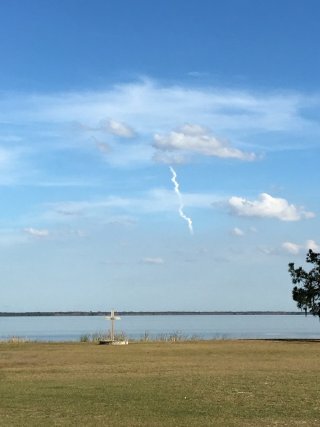 We saw the Space-X launch contrail! 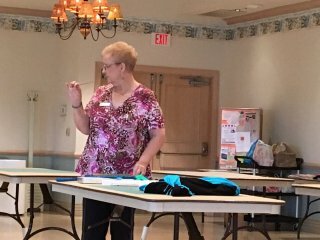 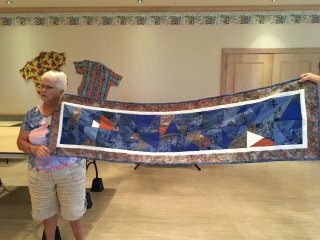 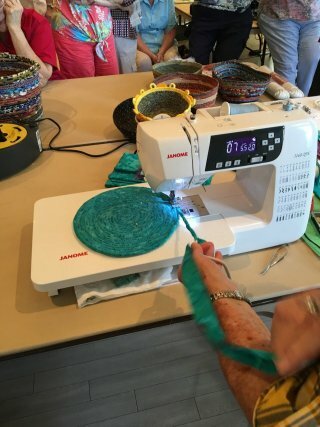 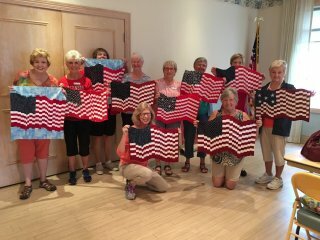 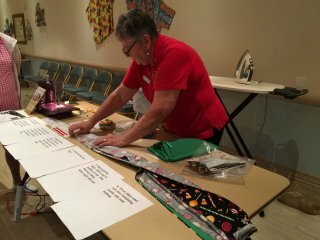 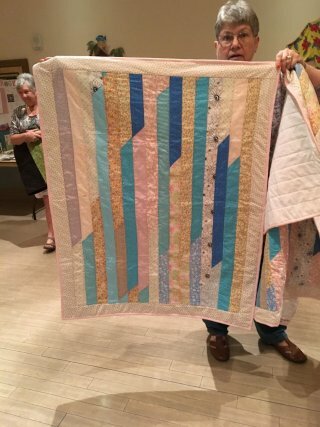 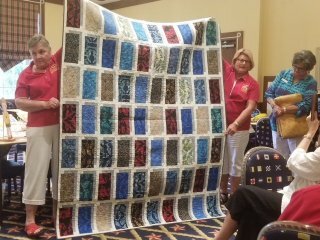 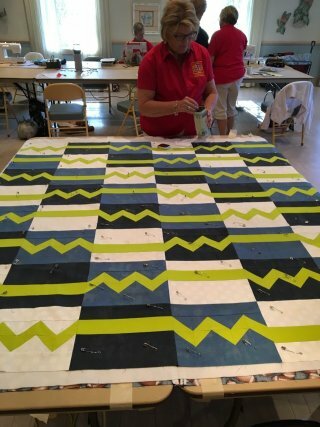 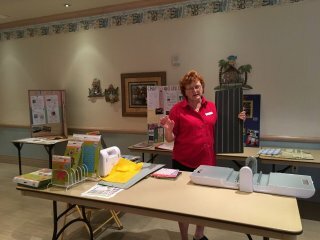 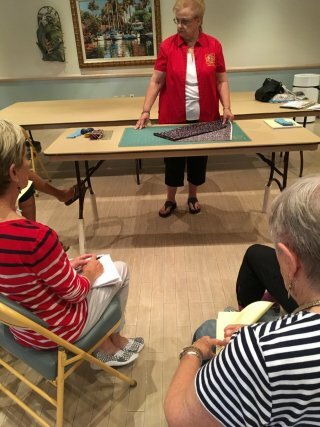 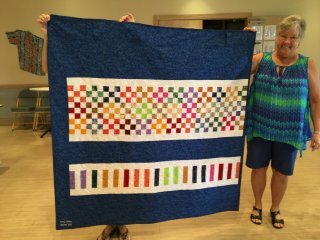 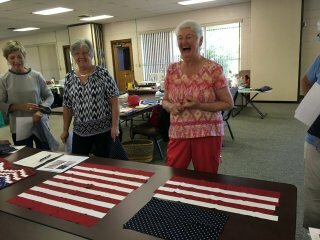 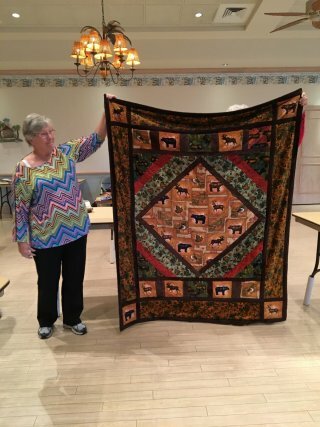 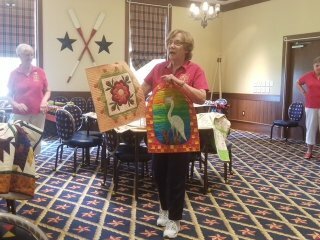 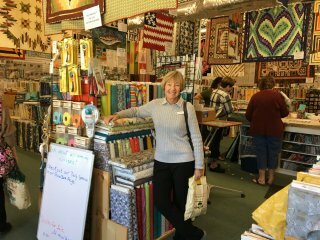 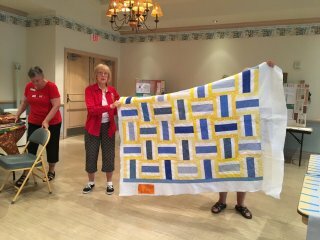 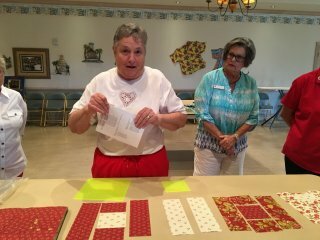 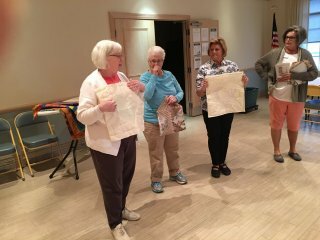 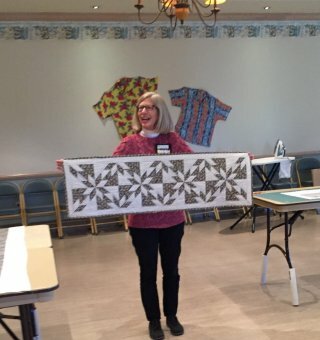 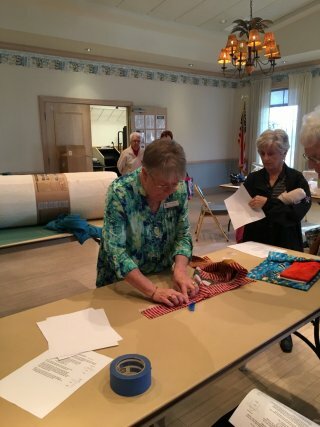 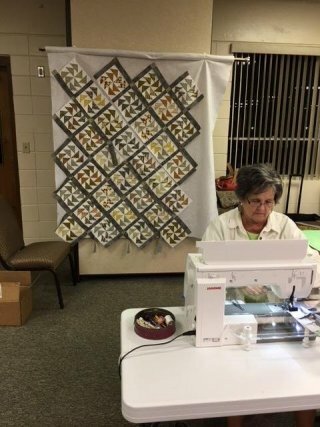 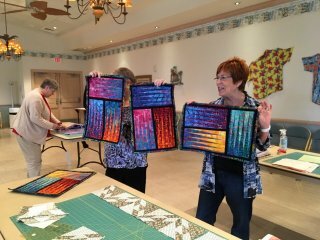 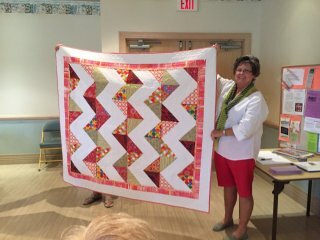 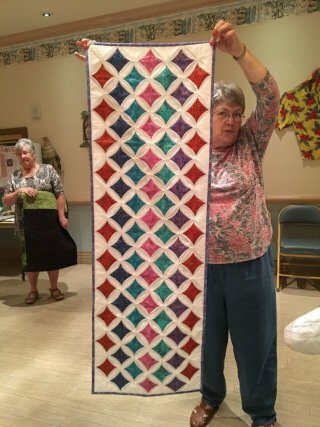 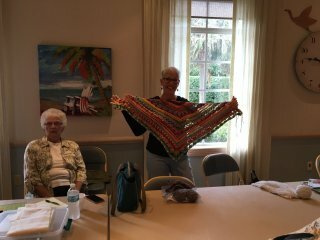 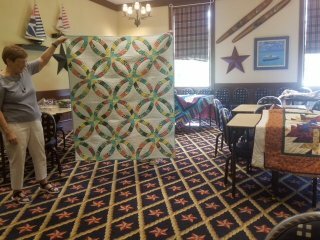 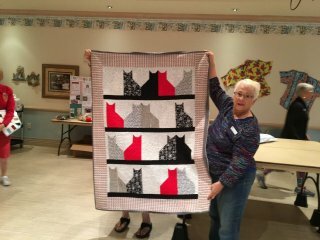 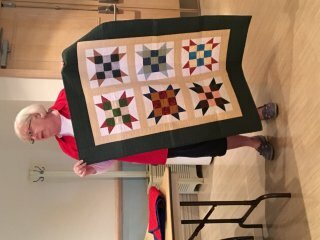 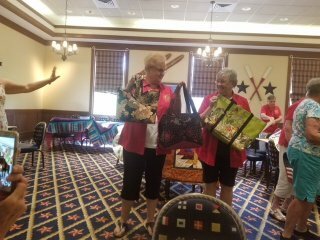 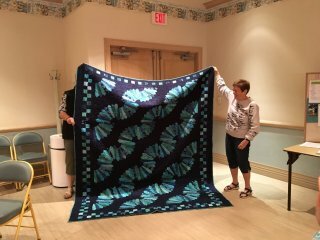 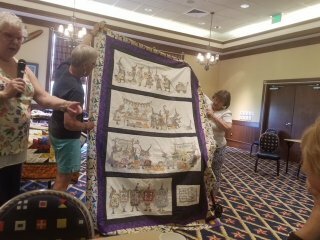 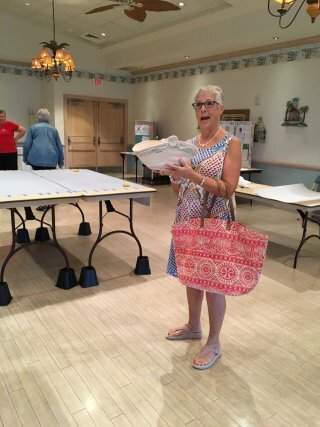 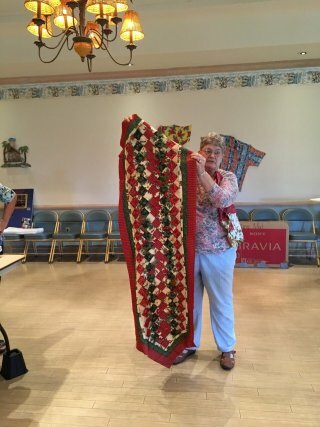 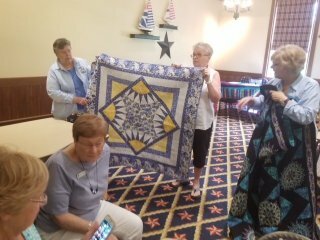 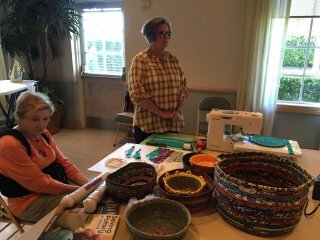 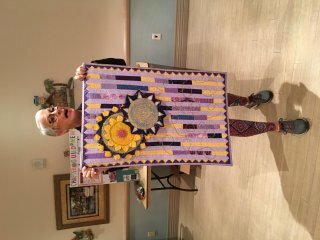 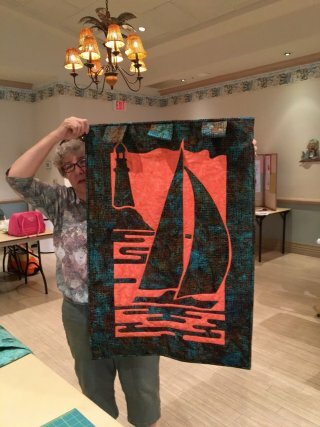 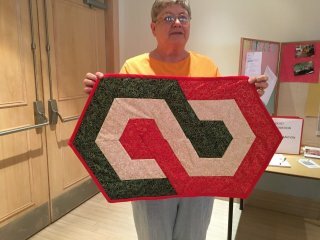 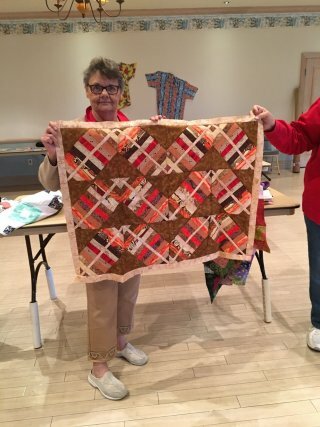 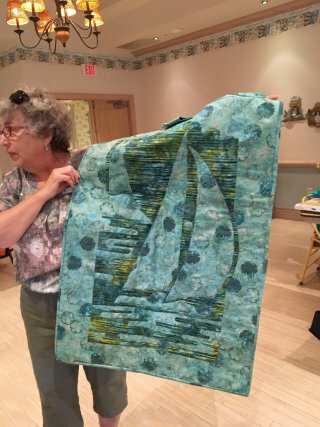 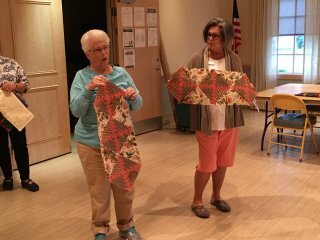 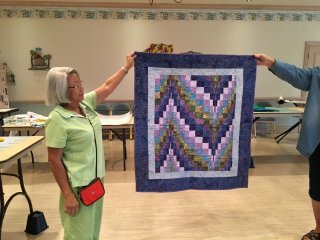 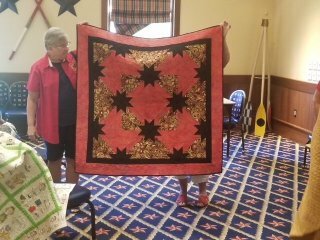 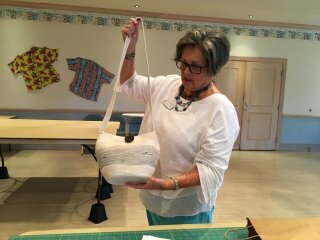 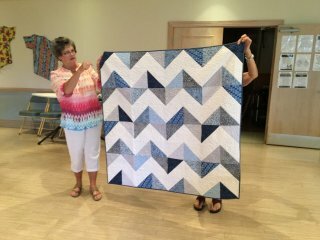 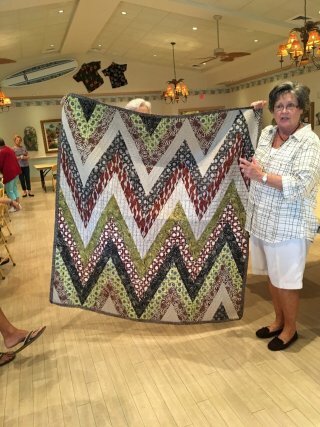 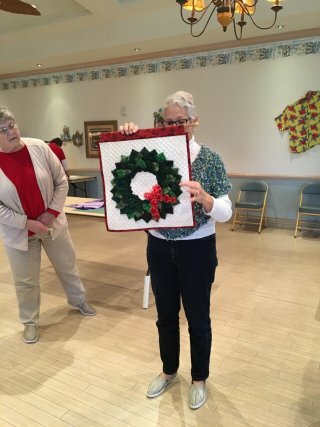 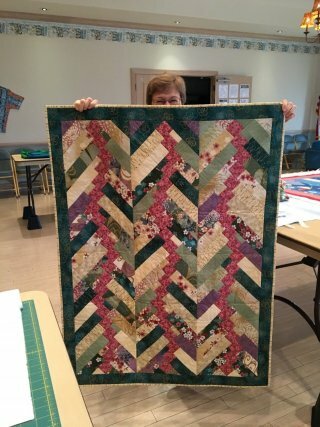 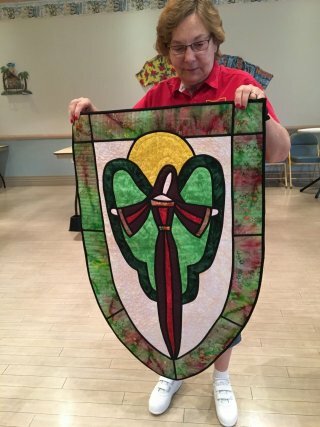 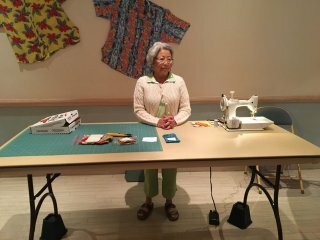 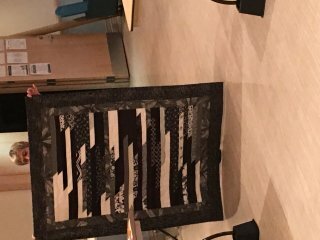 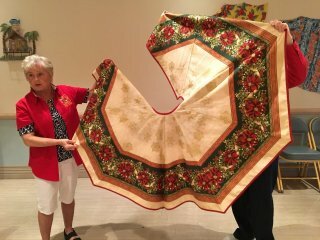 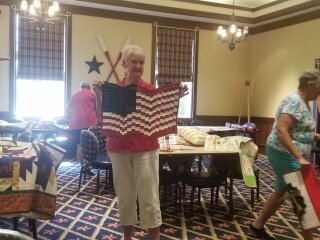 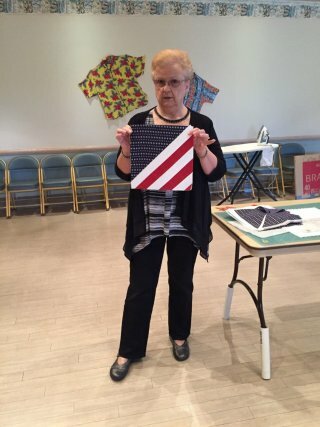 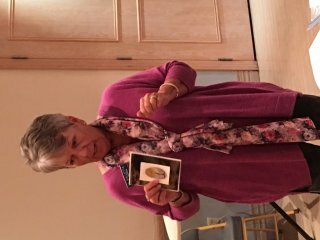 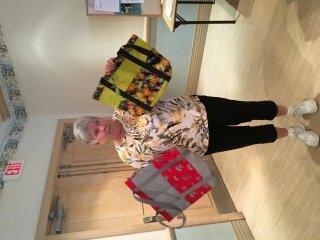 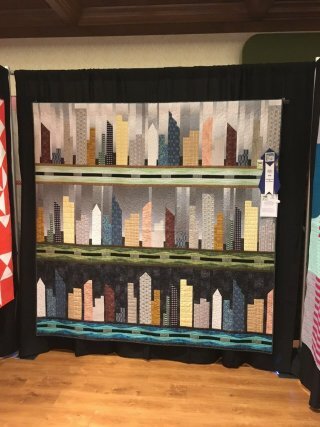 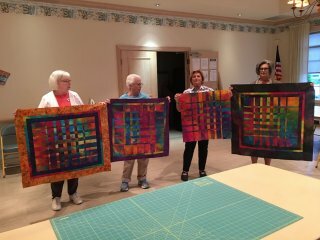 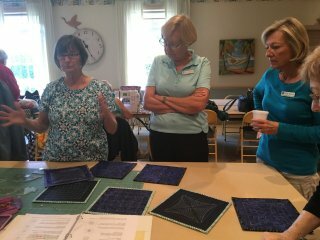 Pat Reed teaching her Bargello Flag Class! 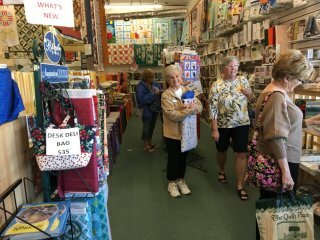 A FULL day of shopping!! 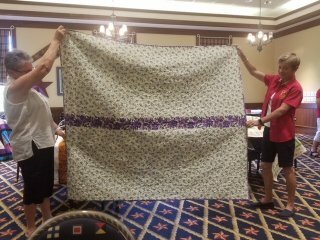 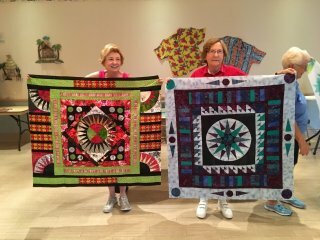 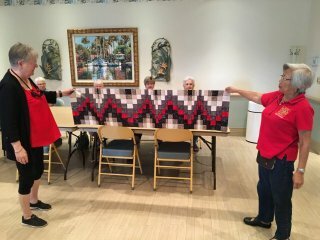 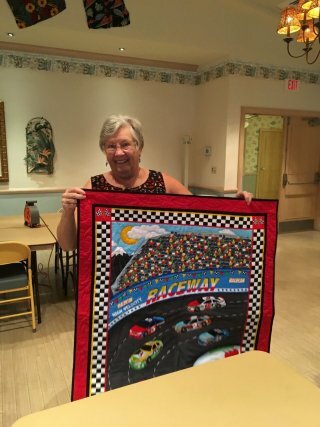 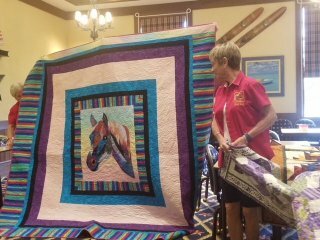 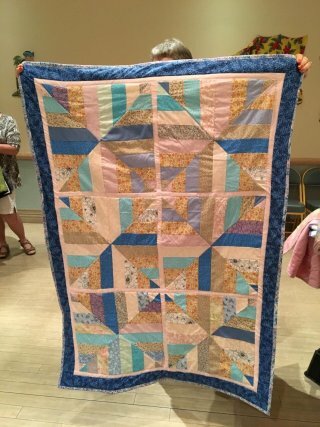 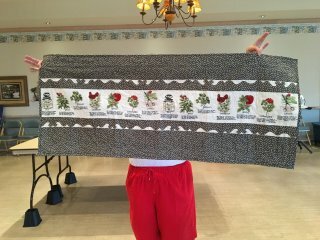 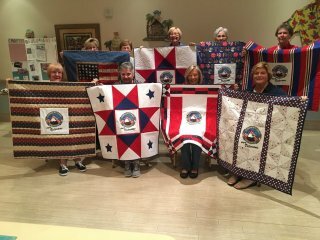 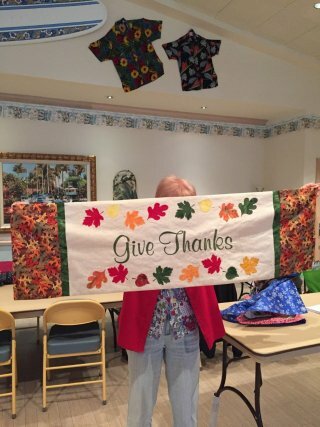 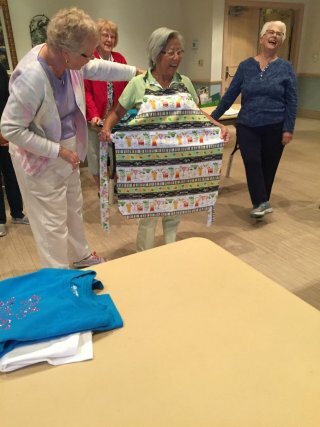 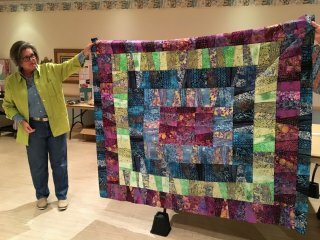 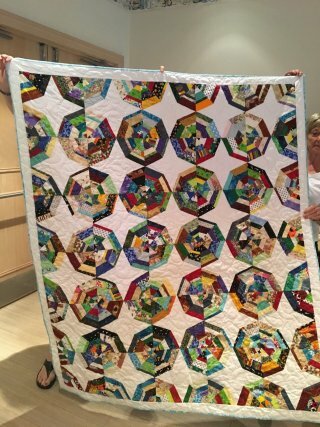 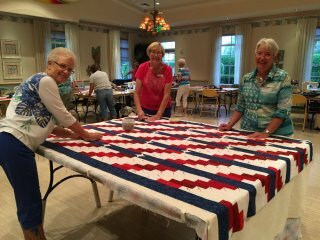 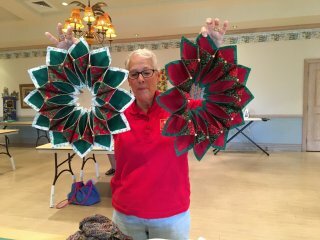 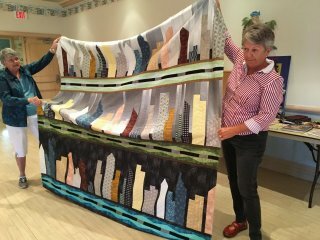 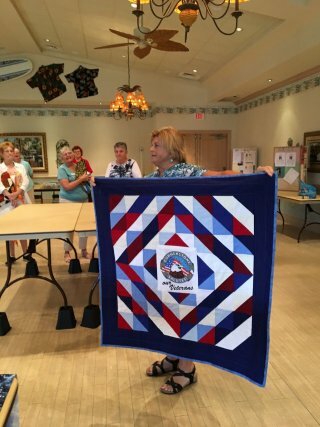 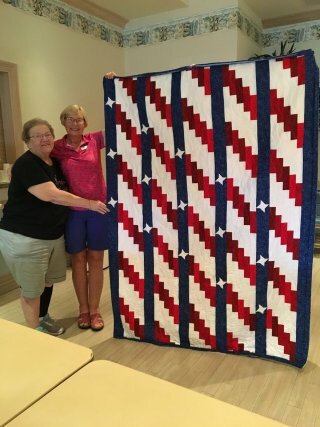 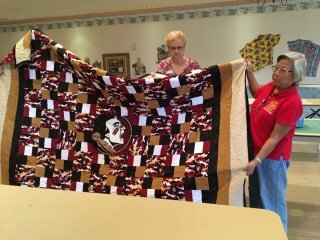 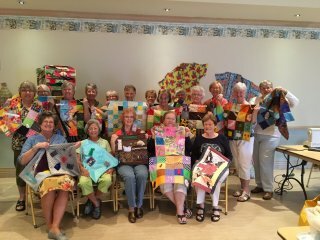 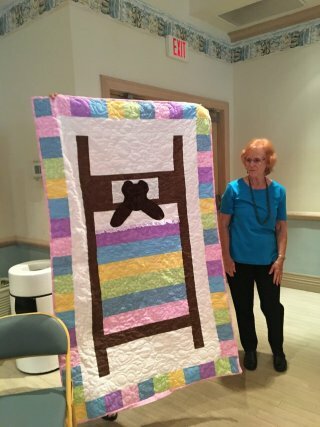 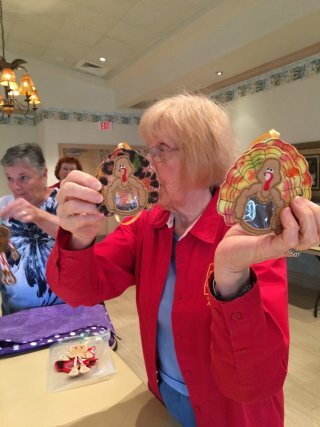 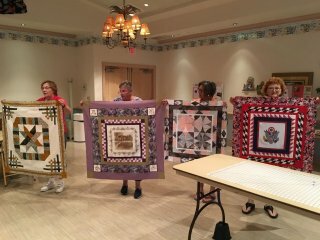 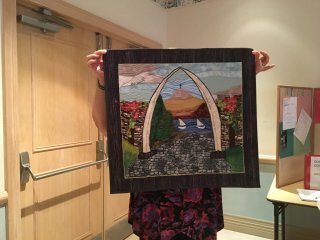 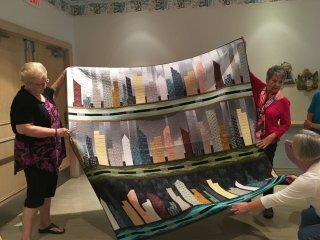 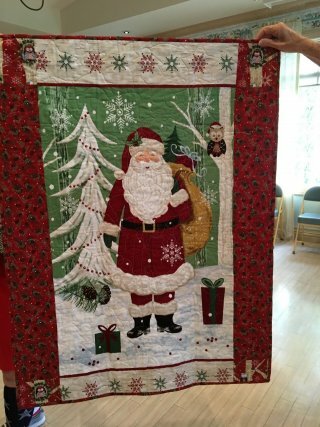 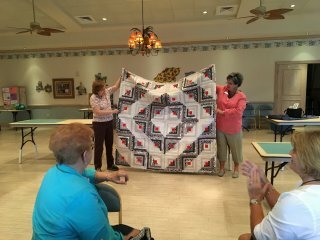 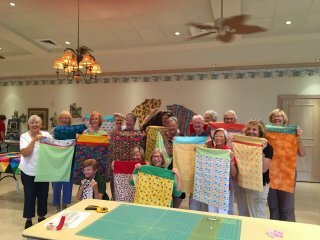 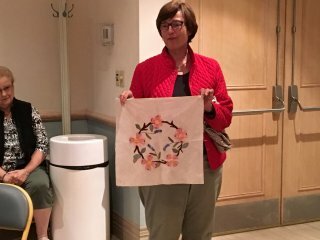 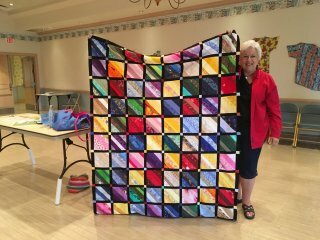 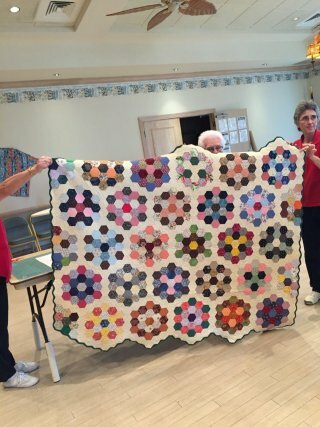 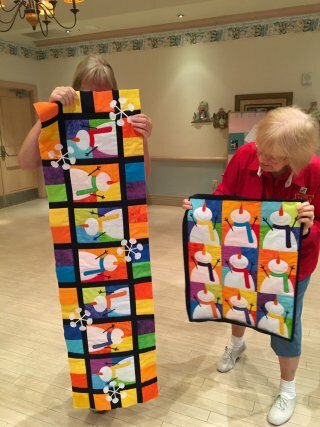 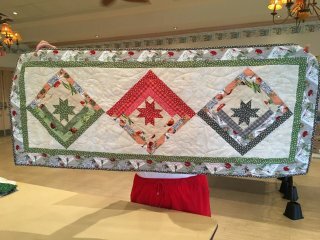 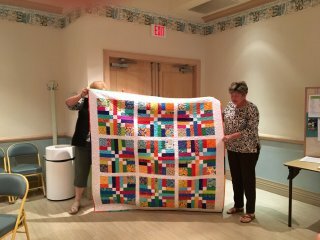 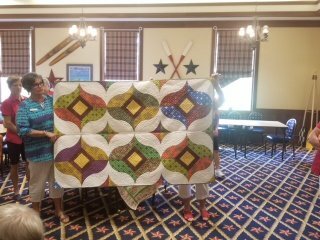 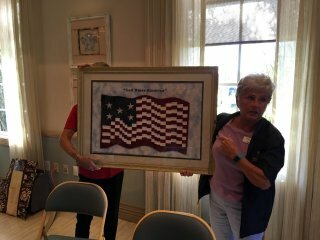 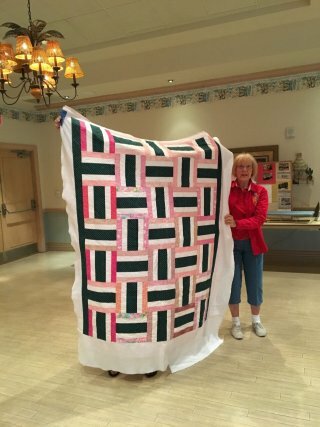 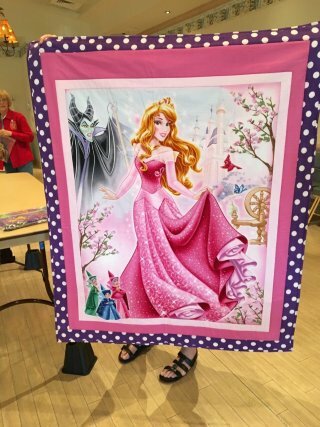 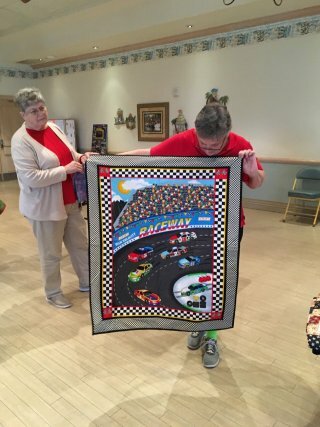 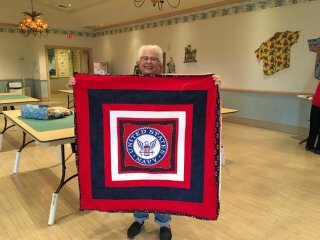 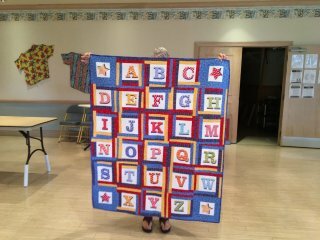 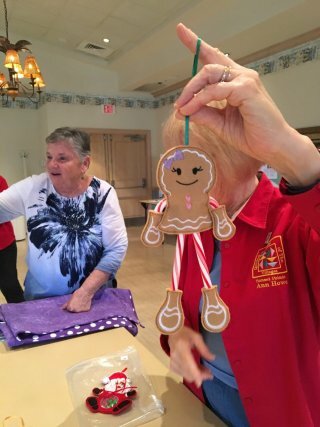 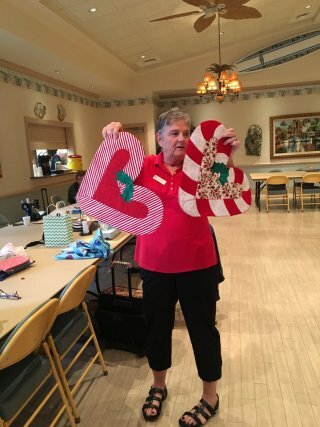 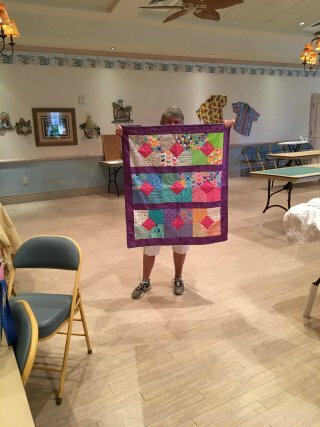 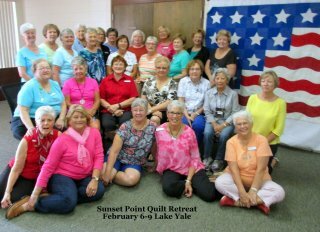 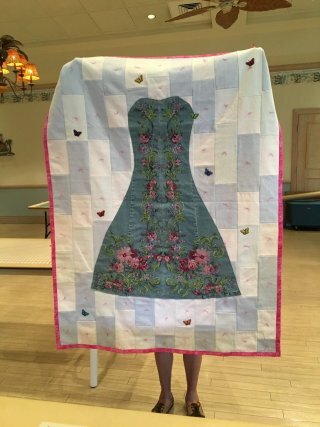 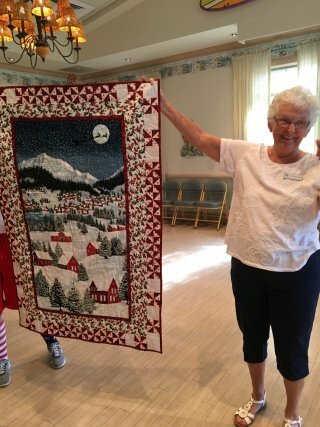 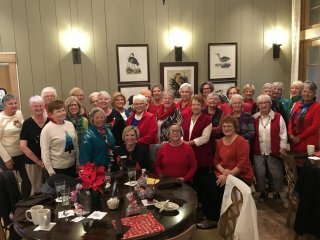 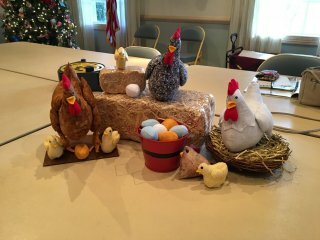 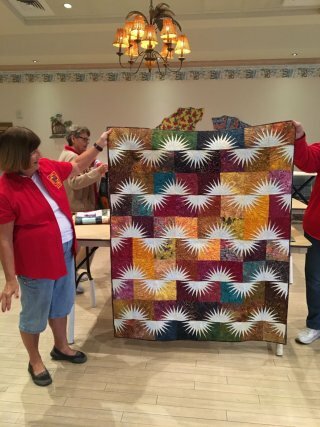 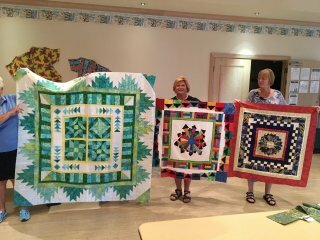 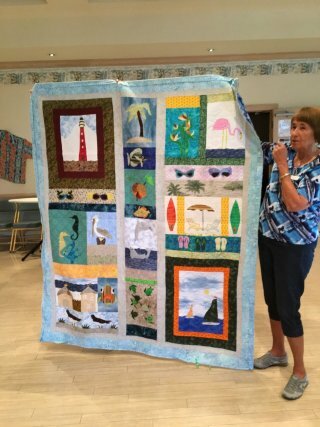 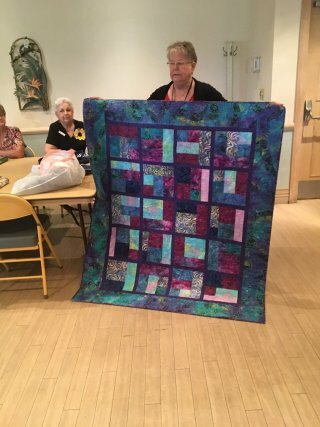 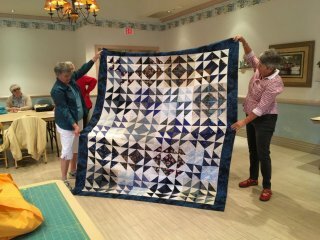 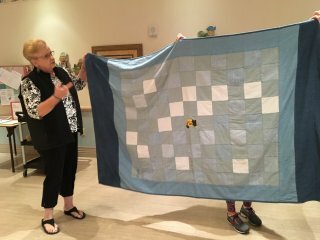 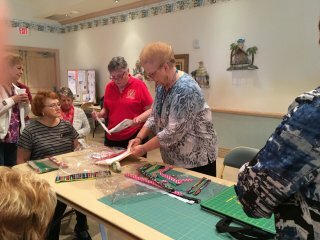 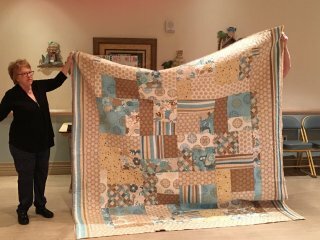 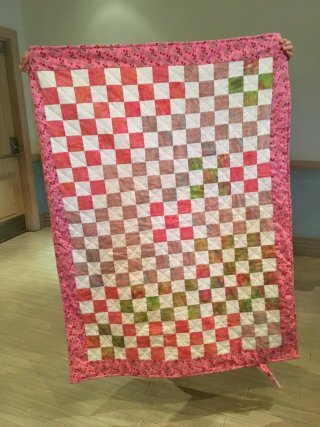 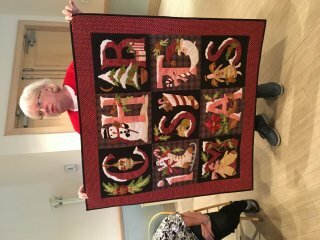 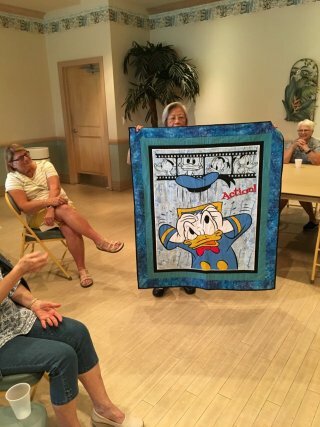 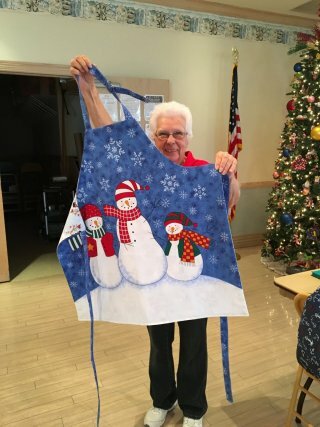 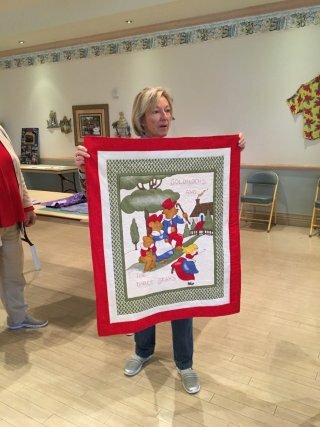 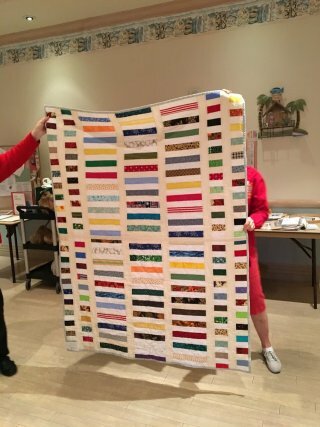 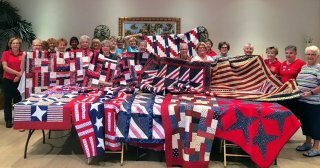 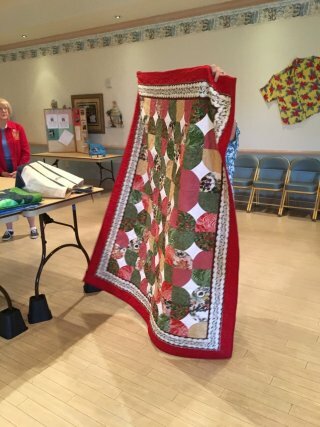 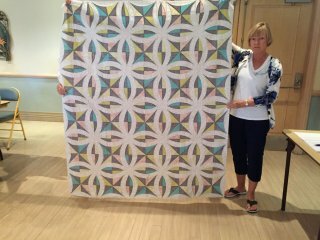 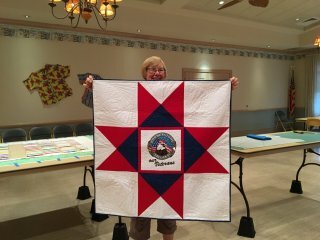 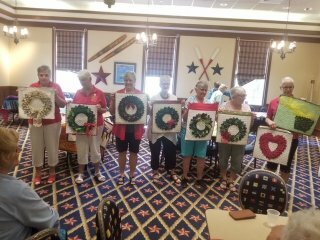 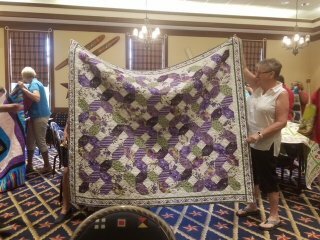 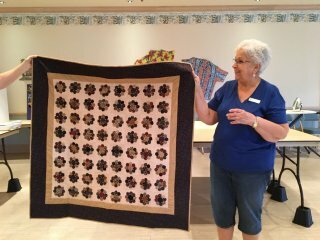 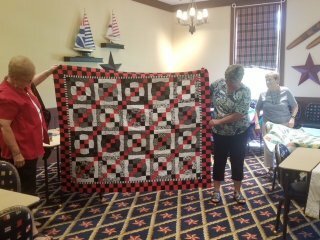 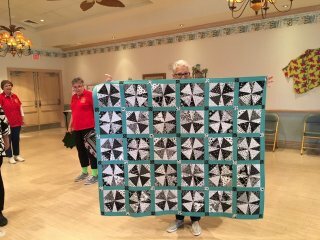 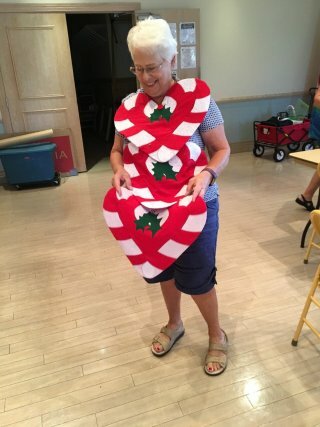 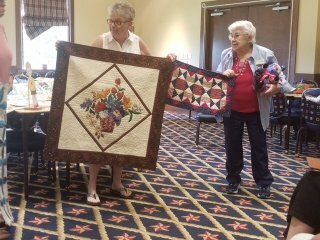 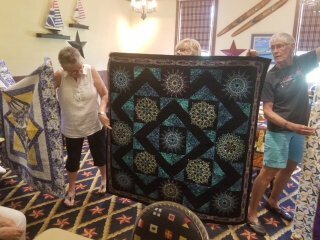 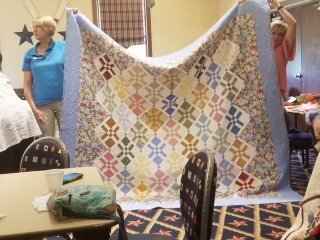 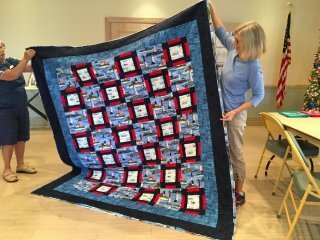 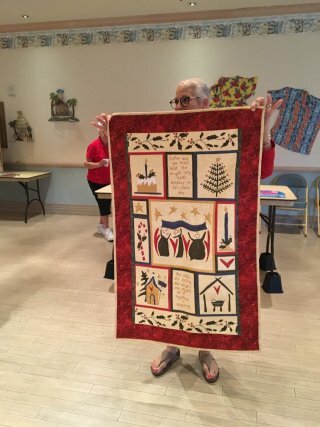 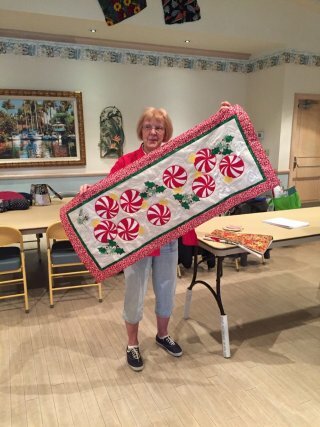 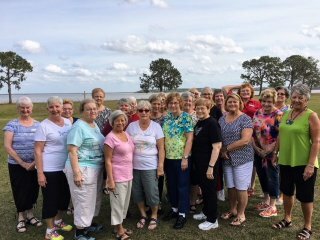 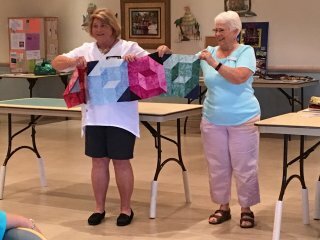 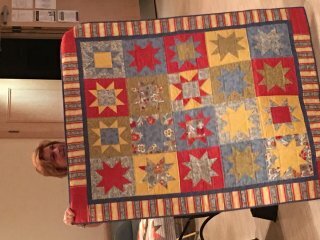 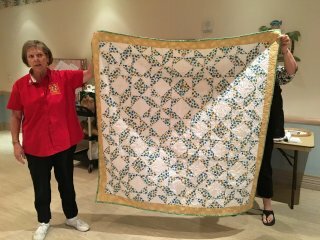 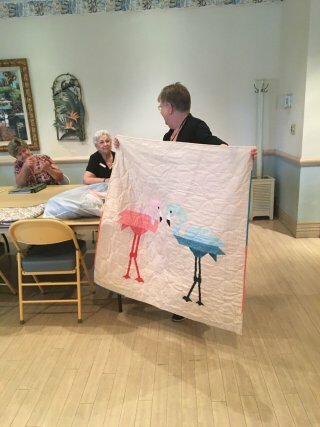 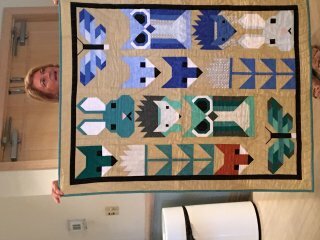 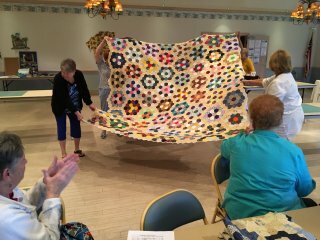 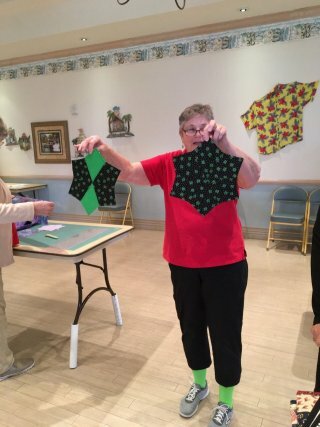 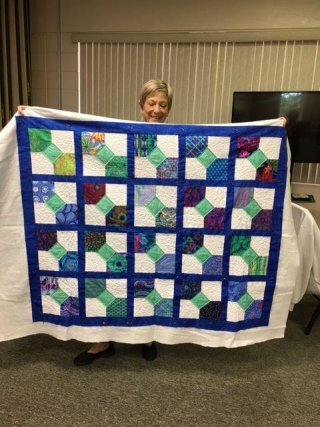 50 Fidget quilts were donated to Serenades, Memory Care Assisted Living at The Villages. 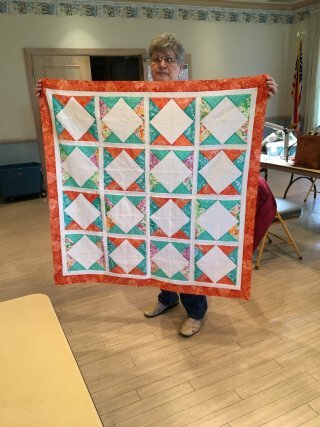 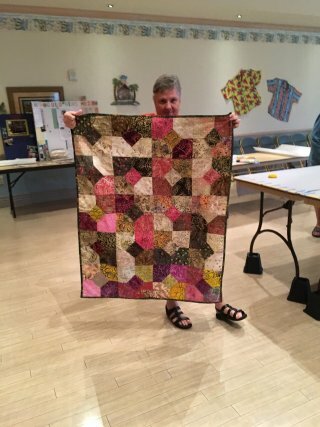 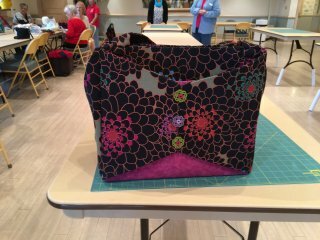 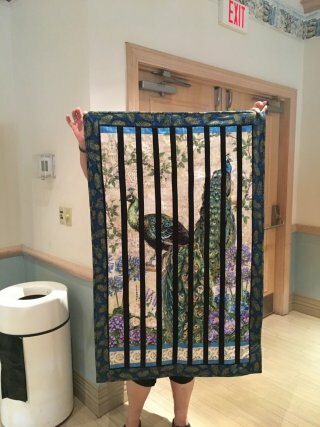 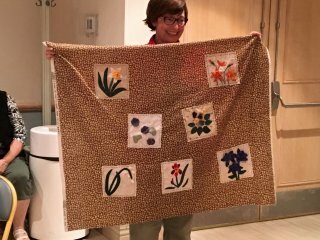 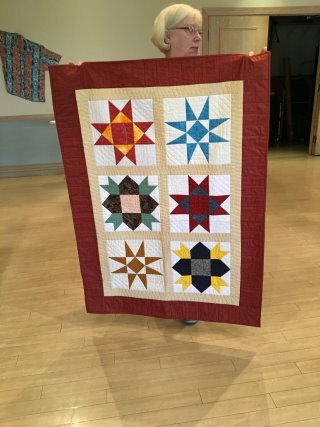 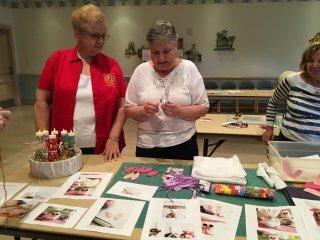 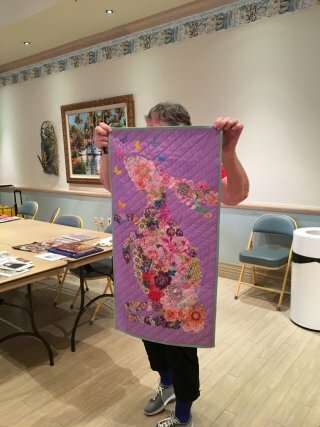 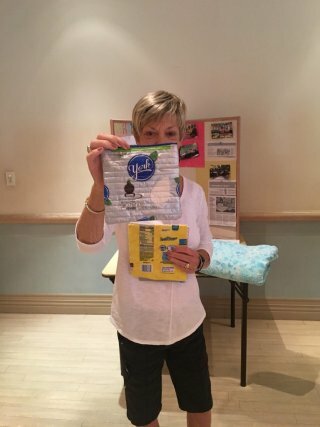 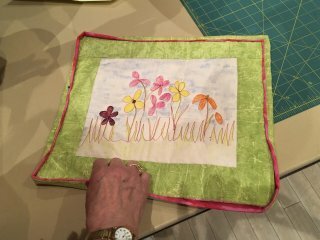 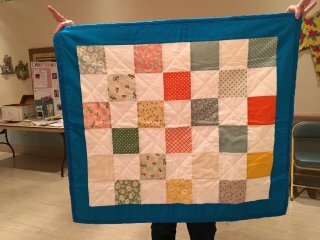 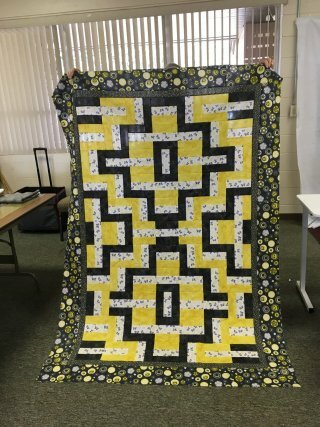 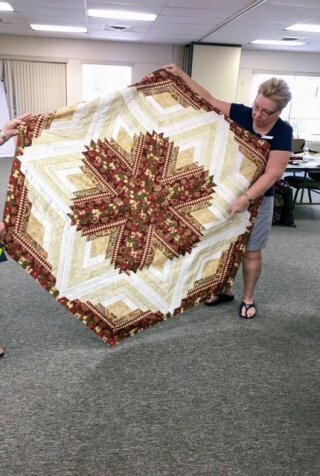 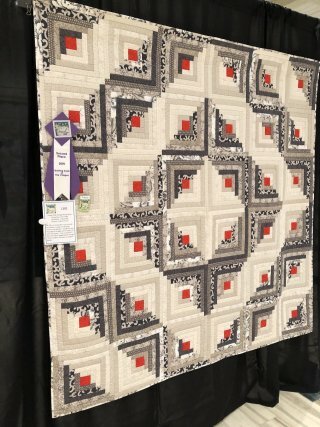 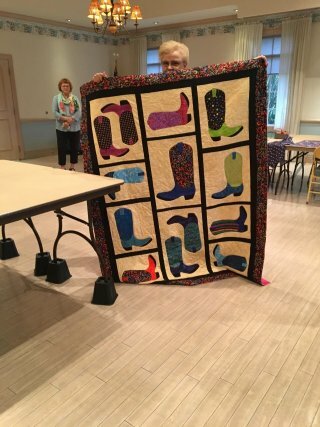 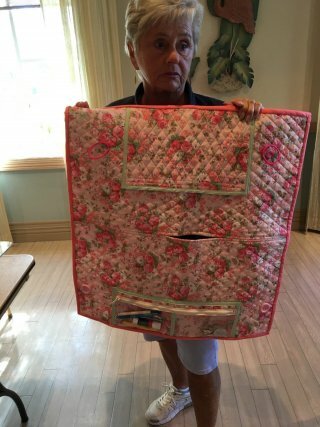 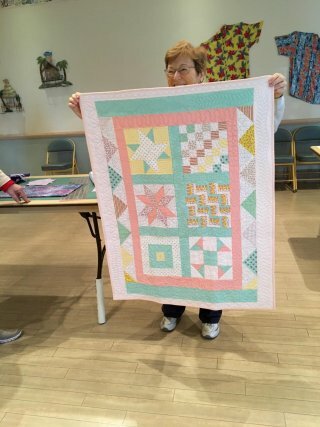 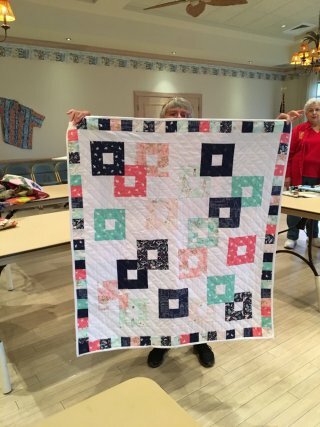 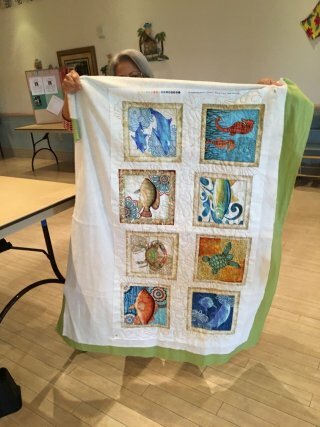 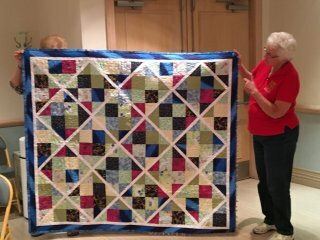 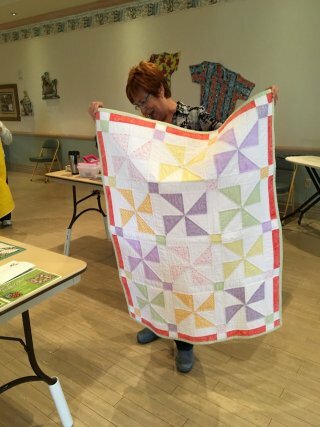 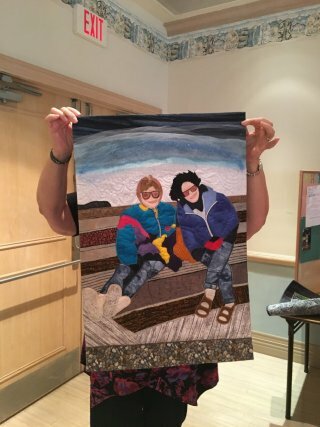 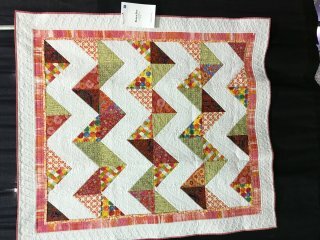 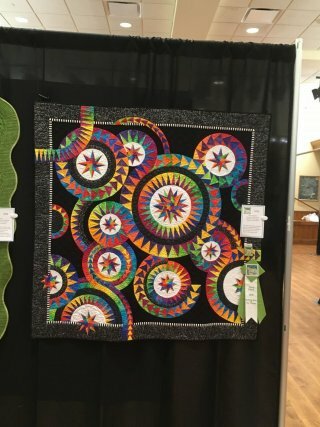 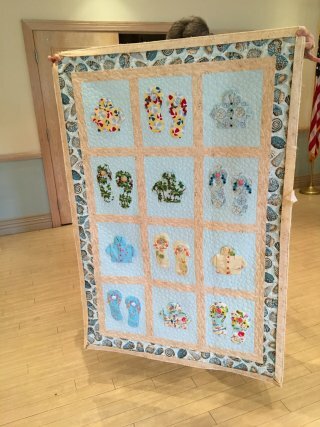 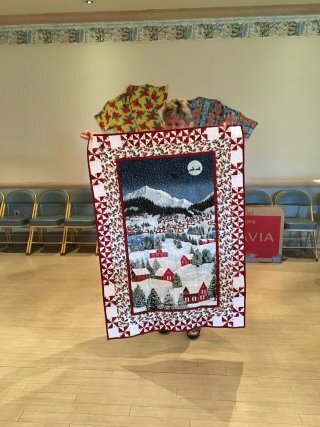 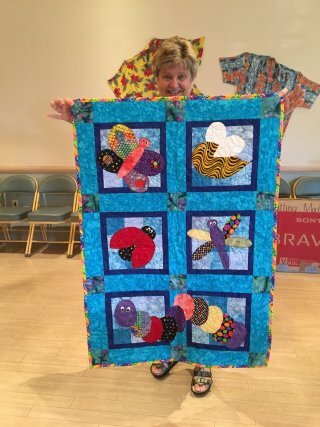 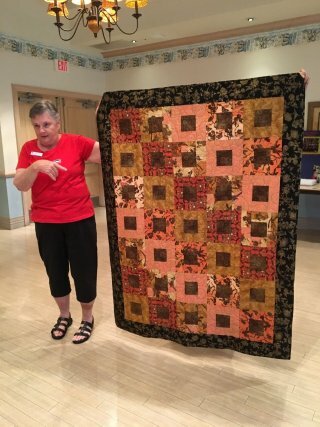 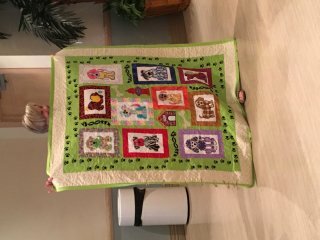 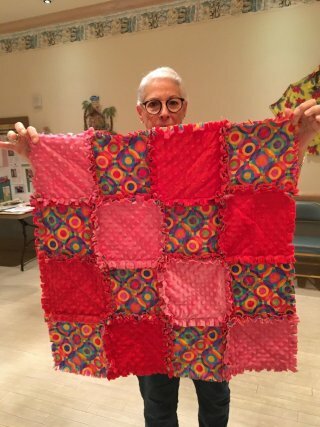 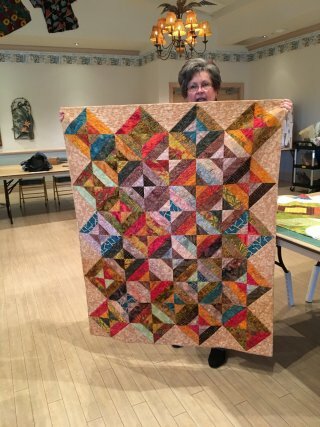 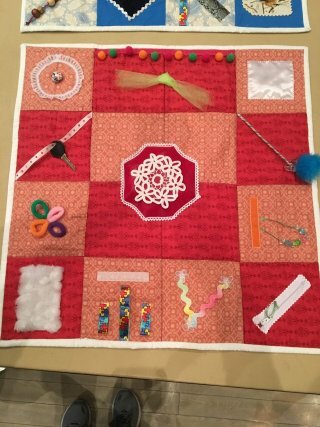 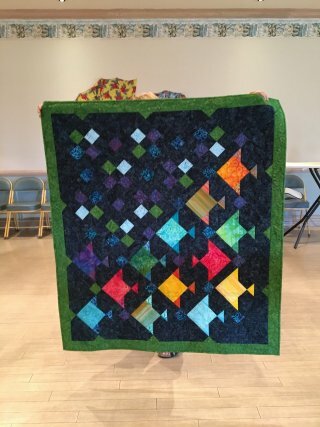 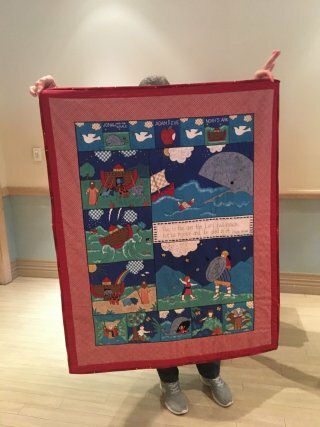 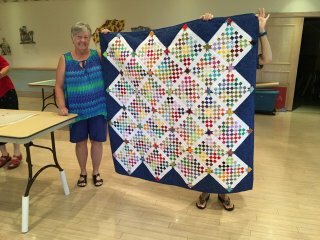 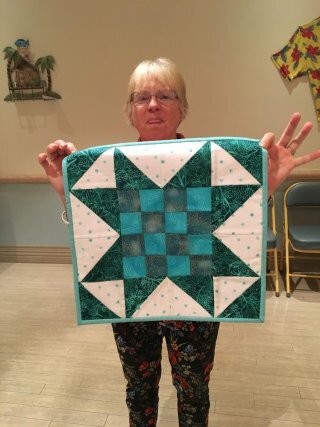 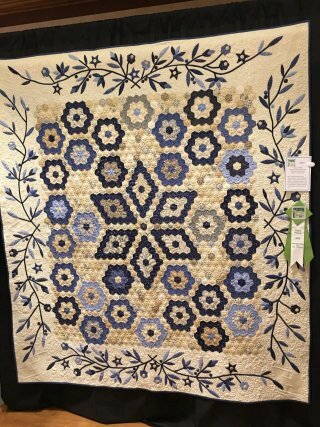 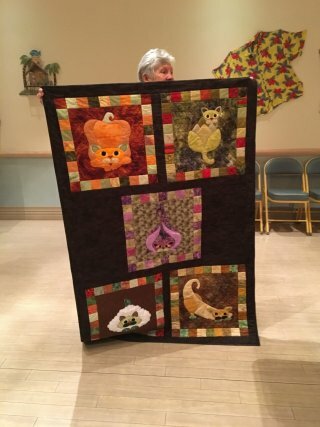 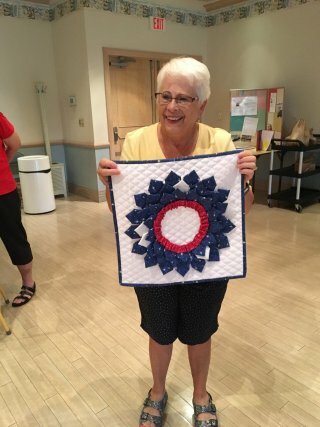 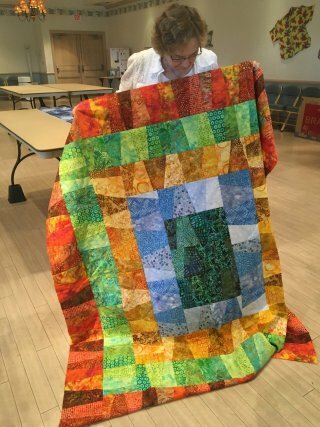 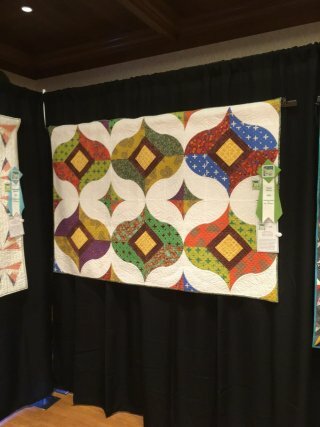 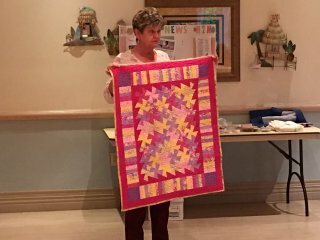 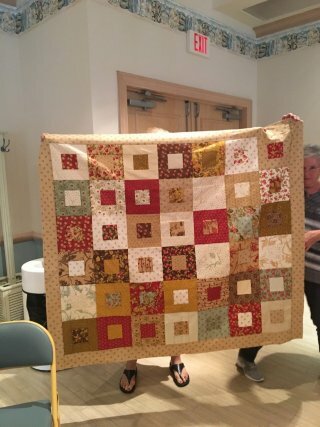 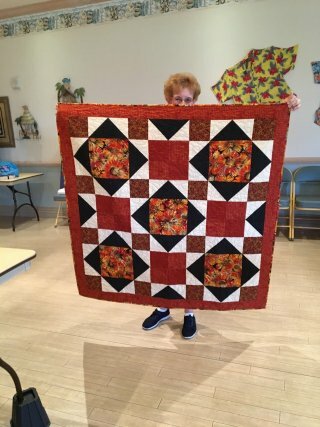 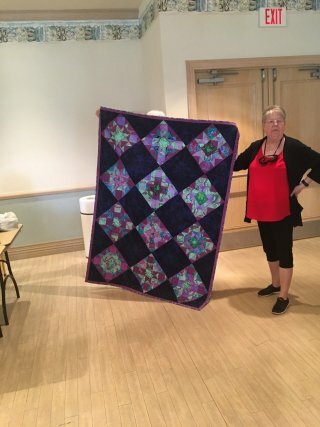 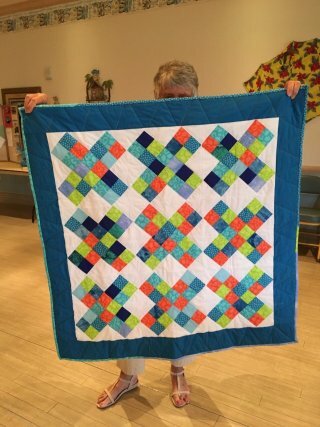 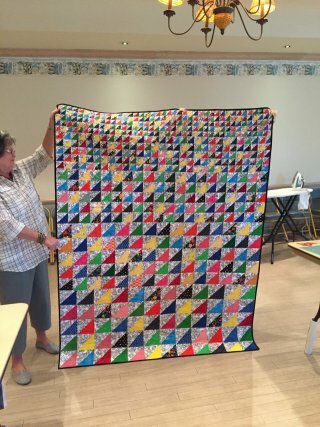 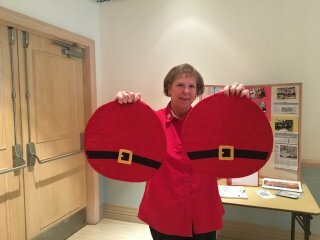 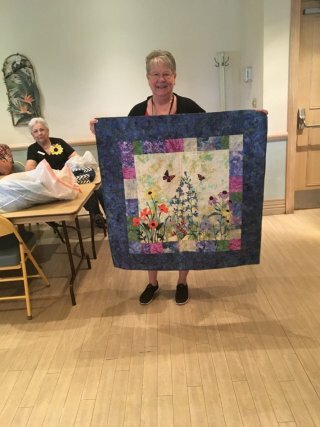 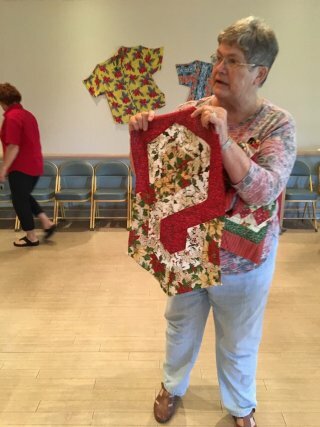 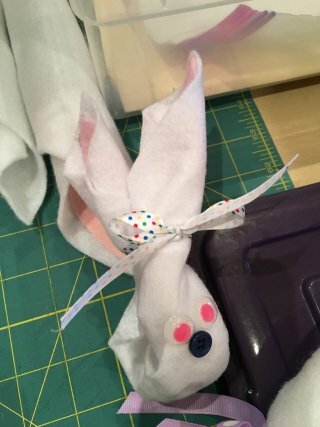 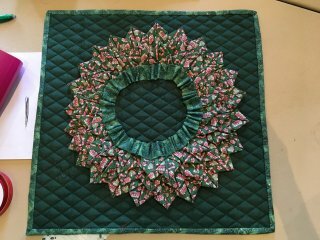 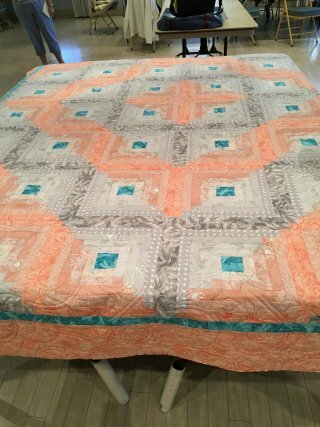 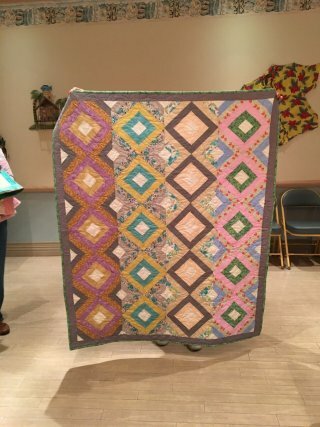 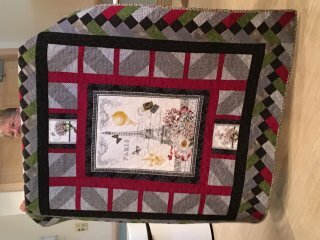 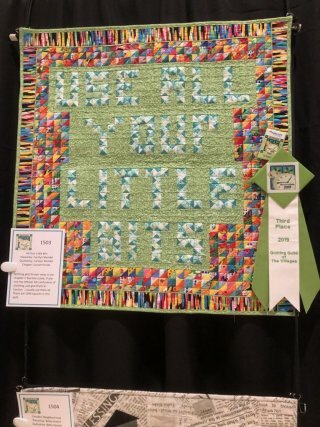 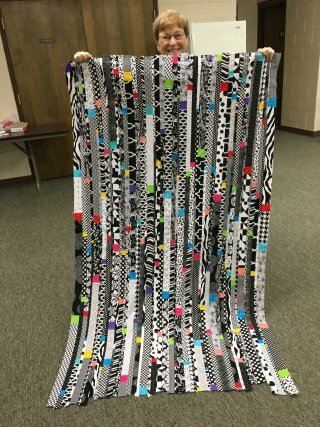 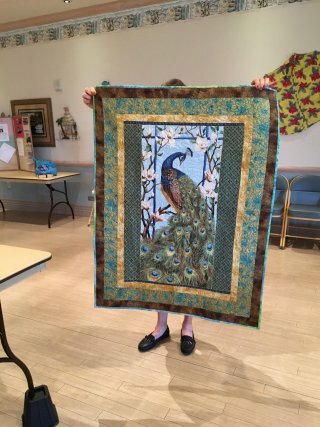 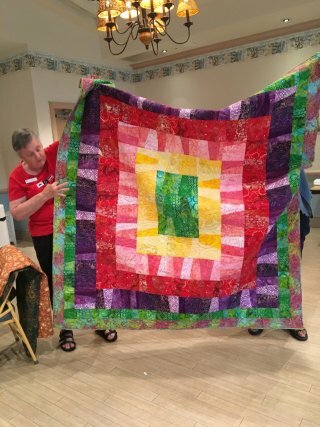 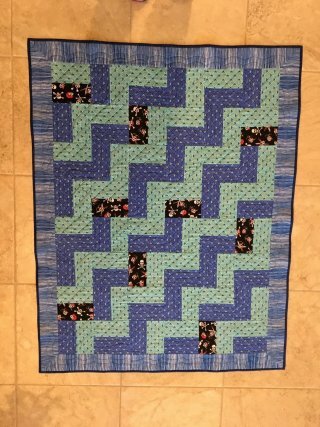 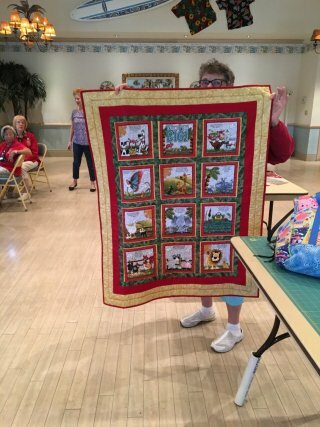 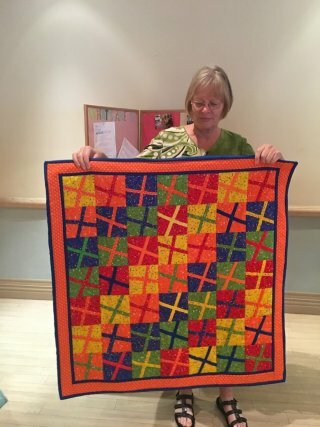 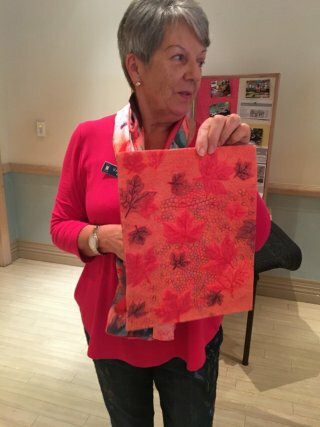 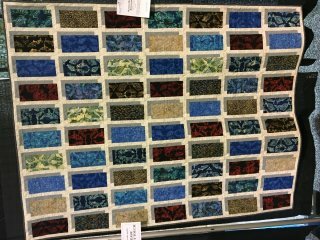 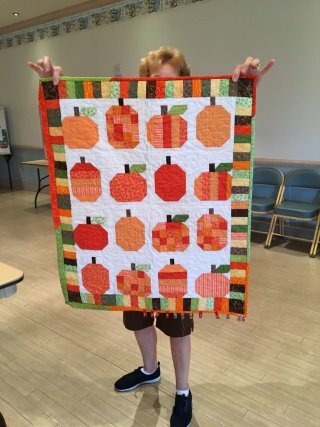 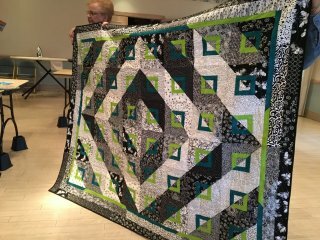 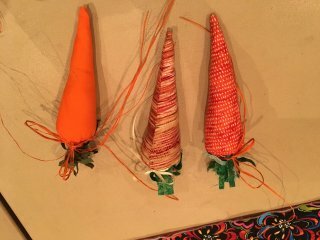 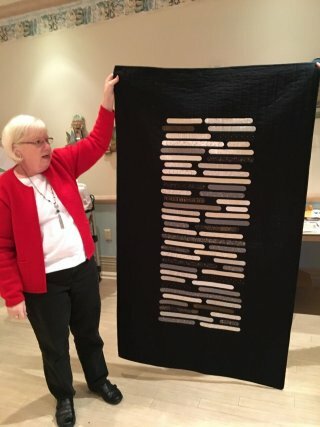 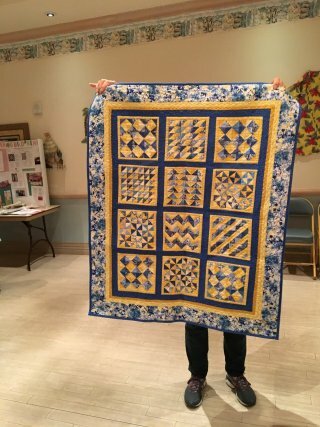 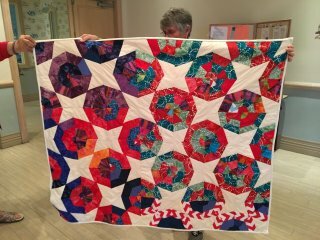 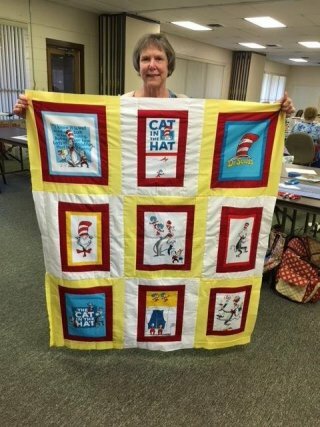 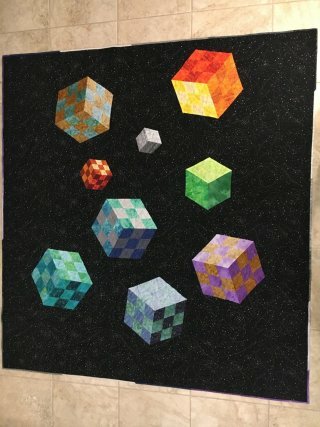 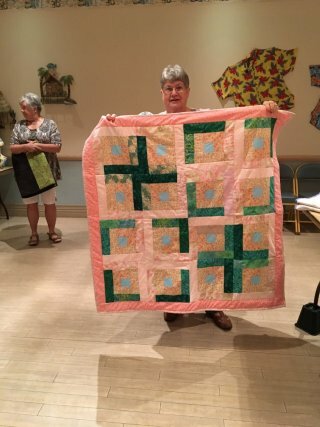 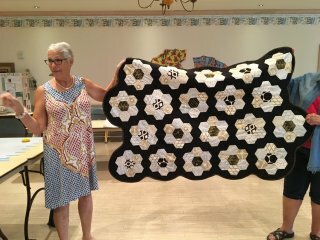 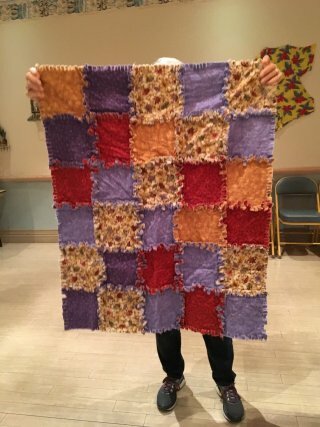 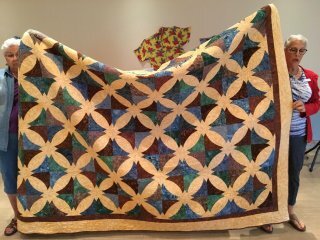 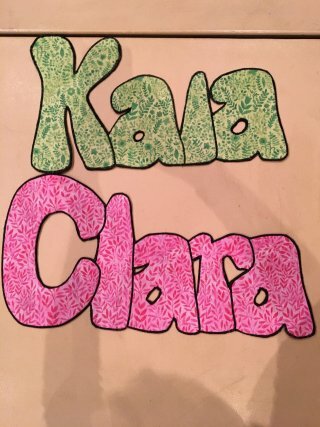 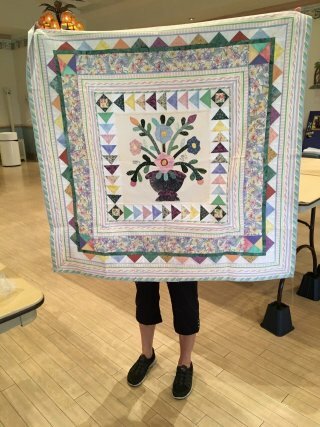 Fidget Quilts are small quilts that provide sensory or tactile stimulation for the restless or "fidgety" hands of someone with Alzheimer's or related dementias.